Grade II Listed Cottage. Enclosed Garden. Parking. Free WiFi. Pets welcome. 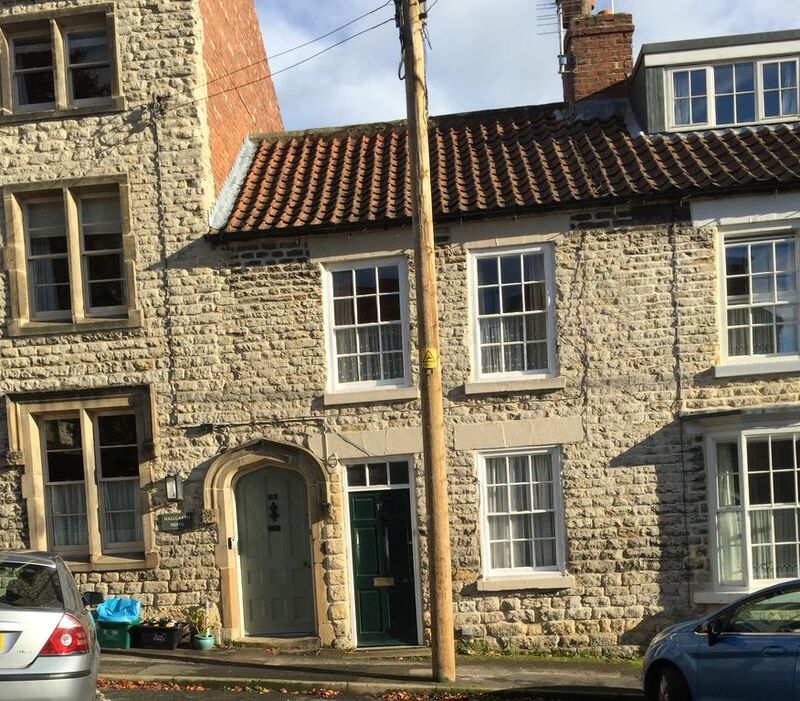 17 Hallgarth is situated on the edge of the market town of Pickering in North Yorkshire. It is within easy reach of shops, pubs and cafés but a short drive away from the open countryside of the North York Moors. The cottage is comfortable and well equipped to a high standard with all modern conveniences in a traditionally furnished property. The cottage has a comfortable living room with plenty of seating and a seperate dining room. There is a well equipped kitchen with a full range of appliances including a washer/dryer and dishwasher. The cottage is equipped with WiFi which is included in the rental price. The cottage can sleep four in two rooms which are over two floors. The double room is a large room which can easily accommodate two infants in travel cots in addition to two adults. The second room is a twin bedded room. The cottage has a traditional garden which offers lawns and seating on a patio to the rear of the cottage. The garden is fully enclosed and there is a private parking space for one vehicle which is accessible from the rear of the property. Please note 17 Hallgarth is a traditional cottage which as part of its charm has narrow steps, uneven floors and restricted headroom is some rooms. As it is Grade II listed major internal modifications are not permitted. Therefore we would advise that the cottage may not be suitable for guests with restricted mobility. Changeover day is Friday although flexibility is sometimes possible - please ask. Please be aware. There is an increasing trend for scammers to place false listings on sites like this. As a responsible, independent property owner I would urge any potential guest to check out the existence of a property they are interested in by simply performing an online search using the property name. Scammers will rarely go to the trouble to set up fake web sites or pages on social media. My husband and I moved up to North Yorkshire in 2013 after we realised that we wanted to be in our 'holiday home' full time because we loved the area so much. We now live in Pickering and bought our cottage in the same town as an investment because we want to offer people the chance to stay in such a lovely area and enjoy it as much as we do. We have tried to make the cottage truly a home from home and as we are in the area we are on hand to sort out any queries or problems that guests may have. We can also personally recommend places to eat and visit in and around the town. This part of the country really has everything. Yorkshire is known as 'God's own County' and you can see why. We are at the foot of the North York Moors, one of my two favourite places and close to the coast with the seaside town of Whitby( my other favourite place) a thirty minute drive away. Pickering itself is a lovely little market town with plenty of good places to eat and a good variety of shops, including a couple of supermarkets and plenty of smaller independent shops. We have tried to make our cottage as comfortable and homely as possible. If is equipped to a high standard because I believe that when you are on holiday you want to be able to spend your time relaxing and enjoying yourself so you want things like a dishwasher and a washing machine to get the annoying jobs out of the way as quickly and easily as possible. The cottage is equipped with free WiFi and a Freeview TV with a separate DVD player so technology still exists even in Yorkshire. For those of you seeking an escape from technology there is a comprehensive library of books and a selection of board games. Gas central heating and hot water. Emergency electric heaters also provided. All bed linen provided. Duvets supplied as standard. Please mention when booking if you require non feather pillows. Towel bales and bath mat provided. Kitchen towels and tea towels provided. Electric hob and oven, fridge, freezer, washer/dryer, dishwasher, microwave, all small appliances including kettle, toaster, slow cooker, iron and ironing board. Seperate dining room with table which seats four. An enclosed traditional cottage garden with a seating area complete with patio furniture. Please note as in most cottage garden some plants are toxic and the garden contains a small water feature. There is a patio area at the rear of the cottage with seating. We do not provide a barbaque due to the difficulty of keeping them clean but you are welcome to bring your own or use a disposable one. Notes on accommodation: Sleeping accomodation is in two rooms. The double room is a large room which could accommodate up to two infants in travel cots in addition to two adults. The second room is a twin bedded room suitable for children or adults. Please note. Changeover day is Friday, flexability is sometimes possible - please ask Outside: The garden is an enclosed cottage garden with a patio seating area complete with garden furniture. Please note that the garden contains a small water feature and as with most cottage gardens some of the plants are toxic. There is private parking for one vehicle to the rear of the cottage and further parking to the front available on a first come first served basis. Cleaning / Towels / Linen / Maid service: Towels and linen are provided, the property is cleaned on changeover day but laundry facilities and sufficient cleaning materials are provided in the property for any cleaning required during a guests stay. Thank you for your review. My aim is to create a ‘home from home’ for my guests and I am very glad you enjoyed your stay. I look forward to welcoming you again in future. What a lovely cottage! We had such a wonderful time a couple of years ago we decided to return for my birthday in February and had a lovely weekend away. Couldn’t fault the accommodation and there was a lovely welcome pack on arrival. There were Lovely walks to take the dog, and shops right on our doorstep. Wouldn’t hesitate recommending this property to anyone wanting a quiet weekend away! We were three friends travelling together and found the cottage was perfect for us. Extremely well equipped with numerous unexpected touches it immediately felt like home. It was spotlessly clean and in an excellent location, both within the town of Pickering and with respect to the sites of the beautiful North York Moors. Wifi was excellent and parking never a problem. Highly recommended. Thank you Heather! Spacious, clean, everything you need for your stay. Definitely recommend. Pickering is lovely. The cottage is lovely with two good sized bedrooms, spacious living room and kitchen, just about everything you could possibly need for your stay was there, shelf fulls of books and DVDs to choose from, toys for the kids and a nice little garden to sit out in and have lunch. a stone throw away from shops pubs and cafes. Would definitely return. Lovely cottage. Very comfortable. Would recommend. Surprisingly spacious cottage and well appointed. Very clean. Ideal for four people. We particularly enjoyed the basket of goodies - fresh bread, biscuits, cake, cheese, tea and coffee. Fresh milk in the fridge. Everything perfect. Would highly recommend. The coastal towns of Whitby and Scarborough are approximately a thirty to forty minute drive away. The town of Pickering contains a good selection of shops including supermarket and many smaller independent shops which provide a range of goods and services. There are several banks and a Post Office. There are good pubs, cafés and restaurants within easy walking distance of the cottage. The town is home to the North York Moors Railway a heritage railway which runs steam and heritage diesel trains between Pickering and Whitby. Booking Notes Deposit of 25% of full rental payable on booking with balance due eight weeks before start date of holiday unless the holiday start date is less than eight weeks away in which case full balance is payable on booking Full terms and conditions of booking are available on my website. Changeover Day: Friday. Flexibility is sometimes possible- please ask Arrival is from1500 on the first day of booking Departures by 1000 please on the final day of let Notes on prices: No increase for the school holidays. Flat rate all Summer. Please note prices shown are for 7 nights, with a nightly rate also shown. The minimum stay is 3 nights with short breaks available by arrangement. Please contact me for availability and prices.